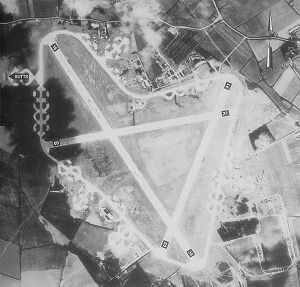 Work commenced on the construction of this airfield (one of 10 similar airfields in Essex), which lies in the Essex parishes of Little Waltham and Boreham in May 1943. The first of approximately 65 Martin B26 Marauders of the 394th Bombardment Group of the 9th USAAF arrived at the newly built Boreham airfield (known as Station 161) on 24 February 1944. The Group’s first mission to bomb an airfield at Beaumont le Roger in France, took place on March 23 1944. Between March 23 and July 23 1944, the Group flew a total of 96 bombing missions from Boreham airfield during which they dropped 4,547 tons of bombs against targets such as road, rail and river bridges, airfield gun positions, railway marshalling yards and construction sites and earned the nickname ‘Bridge Busters’. During this time, they took part in Operation Overlord (including the D-Day landings) however as the Allies advanced through Europe, the 394th Bomb Group was moved on 24 July 1944 to Station 455 at Holmesley South (near Christchurch, Hampshire) in order that they could give a closer and more flexible air support to the ground forces. During their stay at Boreham, a total of 61 air crew of the 394th Bomb Group lost their lives during missions carried out from the airfield. On 24th March 1945, 81 Dakotas of the 315th Troop Carrier Group of the 9th USAAF used the airfield to ferry 1300 paratroopers of the 6th British Airborne Division to the drop zone on the Rhine crossing (Operation Varsity) at Wesel and later that year the airfield was closed. After the 2nd World War, the airfield had a brief history in the early 1950s as a motor car and motor cycle racing circuit. The Ford Motor Company subsequently used the airfield for testing cars and commercial vehicles in a variety of surfaces. The area of the airfield has been subjected to extensive gravel extraction and the remains of the former airfield is now used by the Essex Police Air Support Unit and the Essex Air Ambulance. The following links will take you to sites that contain photographs and further information. Please note that the inclusion of these links does not constitute or imply any endorsement of these sites by the Parish Council.